This takes about 5 hours but, to be honest, I did it in two bits on separate years. 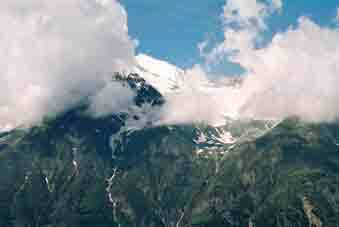 Visp can be reached from Geneva or Basel by train. With the new Lötschberg Basistunnel, it is now only 2 hours from Basel, about the same as Geneva. 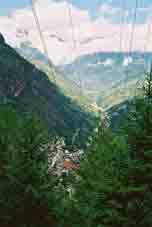 (1993) Start along the road to Zermatt from Visp. This is quite civilised at first, as the bulk of the traffic now goes along the Visp By-pass through the mountain. This joins before Neubruck but cross the actual Neubruck (it's not that new but is next to a truly ancient bridge) to join the pack-horse track up to Stalden (about 1.5 hours). (2002) Join the road by Stalden station & go up (a steep path cuts off the road, saving time) to & across the bridge over the Mattervispa. 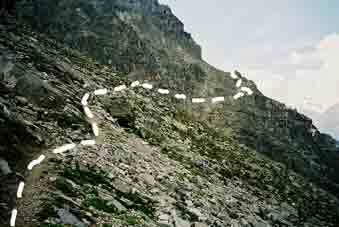 Take the Saas road (note) for about 200m, where a clearly marked path goes up the end of the ridge. (This is strictly, the end of the Balfrin Range). 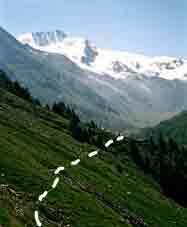 The path is marked for Hohtschuggen, a café at the end of the ridge. The Kummerly & Frey map I was using (as it had the whole trip I was doing on one sheet) had no zig-zags but there were fortunately many, as it is steep. In fact, at the logging track, one turns right, not left as shown, to pick up the track. Hohtschuggen was closed but the view was still there. I walked along the gradually improving path to Grächen, which took 3.5 hours from Stalden. 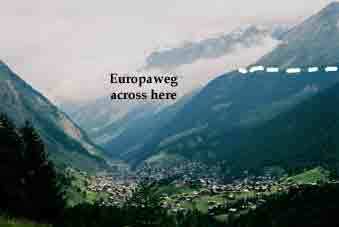 .The Europaweg officially starts in Grächen & is not for the faint-hearted. I set off at 0723. It is quite a walk to Gasenried & I was confused by the start, as the first bergweg mark goes left to the broken bridge. Going the other way (right fork), there is a steepish slog up the Grat at 2273m. I was overtaken by a Swiss group from Fribourg canton who spoke German & who I kept bumping into, as they took long rests. 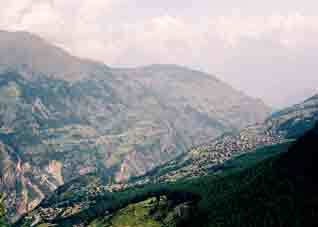 Then, the gradient goes off up to about 2500m & the path becomes rough across the rocks (photo below). 100m after the path to the Bordier Hut goes off is a wider bit with a flat stone, which was the obvious lunch spot (at 1130). After that, the path rounds a headland into a huge gully & a loose-looking stone shoot appears. This is signed 'Cross the danger zone quickly' in four languages but a) it is not safe to do anything quickly in the Alps and b) if like me, you suffer from shortness of breath, you don't have any 'quickly'. Cross the yellowish rock with great care. There are stanchions stuck in it but these have been bent by later rock falls. The path then winds up over another cliff and an unlabelled but similar danger zone has to be crossed. After this gulley comes the high point, about 2700m &, while there are more stone shoots before the hut 6km further on, they are all safe. This is a highly artificial path, made by the Tourist Offices & not by farmers or pack-horses. 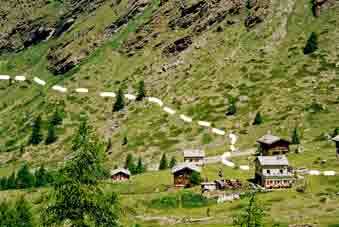 However, although the path looks like a contour on the map, there are two 'umleitung', diversions, where the path has been wiped off the hill by the winter. The first is no big deal, as it involves no height gain but the second drops at Miesboden by a stream which has destroyed the old bridge & struggles up the other side. This is only 0.5km from the hut, so I was tired & did not need this. 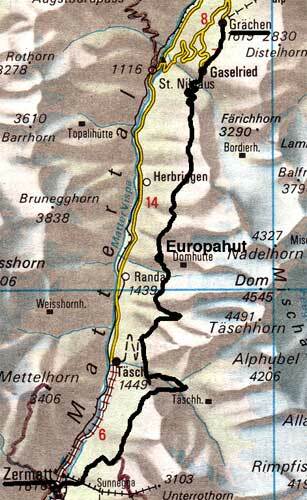 I got to the Europahütte at 1558. I had a beer with the Fribourgers, then destroyed the excellent dinner of asparagus soup, fleischkase with egg & tortellini and meringue. The path before the branch to the Bordier Hut. Good path. A light buffet breakfast at 0650 & a Sfr72 bill with beers. Not bad. It was a beautiful day & I was away alone at 0721. The Swiss left at 8, they later told me. Back at Gasenried, it had said the Europaweg was closed after the hut & there were signs to that effect after a short while. 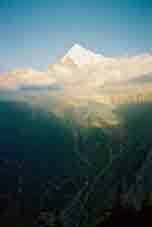 It apparently referred to the stonefall opposite the hut, which is in a gorge below the Dom Hut. 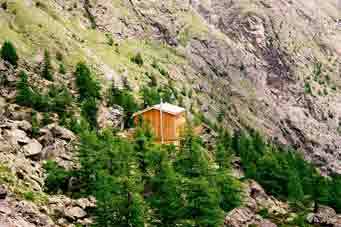 I crossed the police tape & found that the stonefall was a lot more stable than the two they let us cross yesterday, so I crossed it, there to find an iron shed like an avalanche shed, to protect walkers from other stones. Nowadays (2010 on) here is a suspension bridge over this section. After about 45 minutes from the hut, after the optimistically named Gruengarten, the Matterhorn first becomes visible & so does Zermatt, although, unlike the Matterhorn, it soon disappears. The path goes up the Wildikin (the gorge below the Domgrat) & here, it reaches the acme of artificiality, I thought, as it is mostly blasted out of the hillside with fixed ropes & a tunnel at one point. 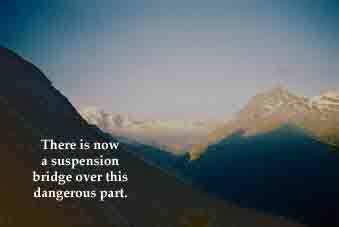 The ropes are mostly unnecessary but a nice thought. Coming out of the gorge & round a headland, the path drops in zig-zags to the stone shoot from the Leiterspitzen called Brand & here is the most extraordinary section of all - a suspension bridge which replaces the concrete 'stone shed' with three tunnels, built to protect against stonefall but since, crushed by it! You can see a video of this by 'leicacase' (Chris Case) on this link. Worth watching. At the end of this is the low point before Zermatt at about 1930m, where it joins the old track up to Ottavan from Täsch & from now on, it is 'real' path on which the Fribougers finally caught up with me, which goes up (& up) the side valley to Ottavan on the Täschalp. 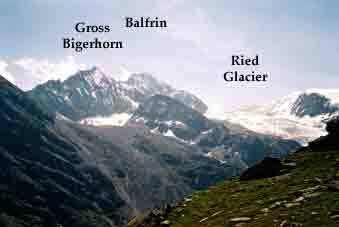 This is the first beer point apart from the hut since Gasenried. 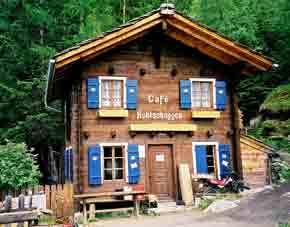 I had one with the Swiss & then, some English turned up, who were bivvying about the Täsch Hut. A couple & son: tough looking bunch. Then, there is a very long & easy walk on the other side of the valley, rising to Tuftern, where I had a Linzertorte (not the world's best) & went the short way down to Zermatt, meeting another English couple at the Standard ski run. Strangely, although the Weg is well marked all the way, there is no sign at the Zermatt end but the direction to do it is North-South anyway. in the morning from the hut. 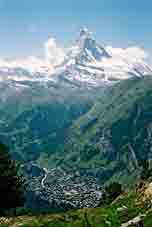 Zermatt from Furi (South). Use any path down from Tuftern or Sunnegga. 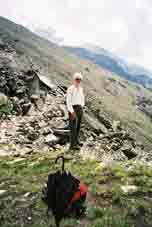 URL: http://www.art-science.com/Ken/Alpine/Zermatt/zermatt4.html Last revised 5/12/2010 © 1998-2010 Ken Baldry. All rights reserved.